The Los Angeles City Council has signed off on a development team for the longtime empty and dilapidated Lincoln Heights Jail, but it could be two or more years before construction actually begins. The winning bid is from the joint venture team of Lincoln Property Company and Fifteen Group. 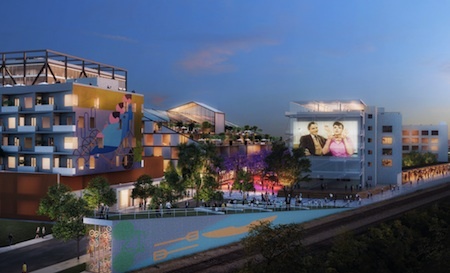 The developers’ proposed Lincoln Heights Makers District beat out two other finalists vying to develop the site on the east bank of the Los Angeles River off Avenue 19 in Lincoln Heights, which is also conveniently within 5 to 10 minutes of six major freeways and a Metro rail station. 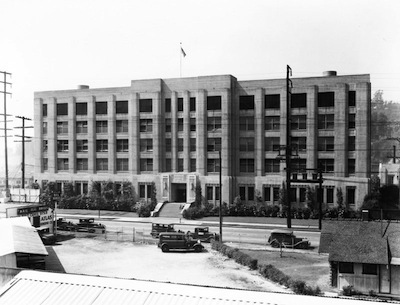 The city stopped using the facility as a jail in 1965, eventually making it available to house nonprofit groups, including the Bilingual Foundation of the Arts (BFA) and Lincoln Height Boxing Gym. The building was permanently closed in 2014, with the city citing structural and other potential hazards as the reason. 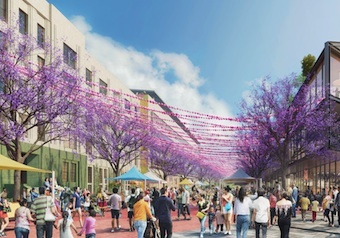 The Lincoln Heights Makers redevelopment proposes an ambitious mix of live-work housing, creative office space, commercial and manufacturing and retail space, a public market, green space that includes an amphitheater, recreation space and a communal rooftop space. The area is zoned “Urban Innovation,” a relatively new classification intended to revitalize underutilized areas and spur job creation through truly mixed-uses, though housing and retail density quotas are significantly more limited than in some nearby areas. Heavy industrial uses, from manufacturing to auto wrecking yards are prohibited. Fifteen Group Vice President Rogelio Navar told EGP they propose to incorporate two properties they already own across the street from the jail into the overall project plan, adding over 3-acres to the overall development. The Lincoln Heights Makers District will run west to east from the L.A. River to San Fernando Road, and from the city yard north of Humbolt to just south of where Avenue 19 and Riverside Drive and Figueroa Street merge. The combined sites will create a destination community, incorporating a variety of uses, Navar said. There will be open space, green space for recreation and for community gatherings, he said, adding that the live-work units could be used by artists. While no specific tenants have been named, Navar said the building identified as Makers Hall would include 40,000 square-feet of light manufacturing, such as craft beer makers or coffee roasters. “Our plan respects the goals of the CASP (Cornfield Arroyo Seco Plan) and the Urban Innovation zoning,” said Navar, adding that other industries such as those in the bio-tech field could find a home at the site. 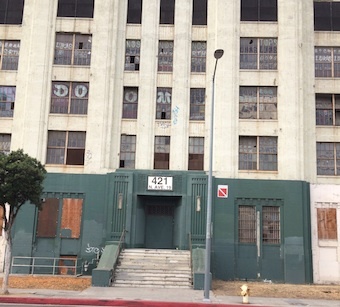 The Lincoln Heights Makers plan includes 57,000 square-feet for residential use on the Lincoln Heights Jail site, and proposes over 200,000 square-feet of residential space on the former MAGA building and Anhing properties – identified in the plan as the 405 Site – on the opposite The side of Avenue 19. Over 200,000 square-feet has been slated for commercial use and another 15,000 would go to retail uses, according to developers’ bid. It includes community amenities such as youth sports fields and community gardens. The developer is also proposing the creation of “Festival Street,” a section of Avenue 19 that could be closed from time to time for community events, such as festivals, farmers market and the like. At a community meeting earlier this year where the three finalists presented their proposals to a specially convened community advisory group and the community, some residents expressed concern that the projects could lead to more gentrification in the northeast area neighborhood. According to Navar, however, the push back from the community over fears of gentrification has been less than in other areas of the city. He thinks it’s because the site has been vacant for so long and is not surrounded by housing, so there is no affordable housing to be lost. “This project will bring the area into the Lincoln Heights community, connecting it to the neighborhood,” he said. “I want to point out that Councilman (Gil) Cedillo did a tremendous job of informing and engaging the community in the process,” Navar said, noting that Cedillo had “appointed a special advisory panel” made up of people from the community, including residents, businesses and the neighborhood council to evaluate the proposals and make recommendations to the city council, ensuring the community had voice, he said. Details of the development contract, including fees to be paid, the disposition of adjacent city-owned property currently in use by the transportation and sanitation departments, still have to be finalized. Once that is complete, the actual permitting process will get underway. “It will probably be two years before building begins,” Navar said.